Porcelain Veneers are a type of dental veneer that is bonded to the surfaces of your teeth to improve the overall aesthetics and sometimes the function of your tooth/teeth. The principle of veneers is similar to that of placing false fingernails offering perfect shape and colour. Veneers are laboratory-constructed custom-made facings, which are mechanically bonded to the tooth surface. Veneers provide excellent aesthetics because the lab can actually incorporate characteristics such as greater opacity and special stains and colours that allow an almost perfect match to your own tooth structure. Emax veneers are made of adjustable porcelain. Therefore, they are very thin and may require little or no tooth preparation. 1st visit – During the consultation visit, you will select the type of veneer you want. We will assess your teeth to determine whether any initial work must be done on your teeth before mounting the veneer. A mould will be taken of the affected tooth and will be used to create the Emax veneer. 2nd visit – The Emax veneer will be bonded to your tooth. 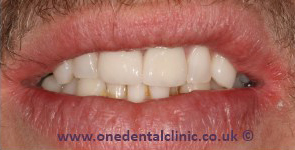 This patient was unhappy with the shape and position of his two front teeth – we used Emax porcelain veneers to improve the aesthetics of the smile. Da Vinci veneers are extremely thin veneers. These veneers have been in use for more than 25 years. They are strong and durable. Used to cover stains, gaps or fill the chipped portion of your tooth. Normally it requires only three visits to get the Da Vinci veneer fitted on your tooth. 1st visit – During the initial examination visit, you discuss what treatment you require for your teeth. The dentist will look at the general condition of your teeth and if required you may have to get some other treatment such as a cleaning or filling of a cavity before you are suitable for the cosmetic treatment. 2nd visit – During this visit, the cast of your tooth requiring a veneer will be taken. It will be given to the technician who will prepare it for your tooth. During this session, a small layer of your existing tooth may be removed (if needed) in order to make place for the veneer. 3rd visit – When your veneer will be ready, you will see your dentist for the final fitting. The dentist will make minor adjustments if required and then the final bonding with your existing tooth will be done. 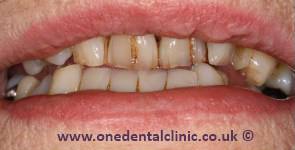 This patient was unhappy with the dark colour and cracks in her teeth. She was incredibly nervous about having treatment and wanted her smile back. 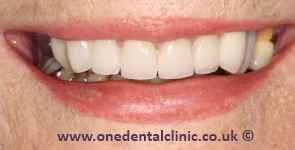 Six veneers were placed on the upper teeth to give her a fantastic result. Procedure of fixing 1st visit – Select the type of veneer you are interested in. 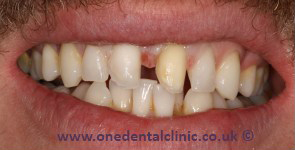 2nd visit – We will make some space on your existing tooth by removing a very thin layer of enamel. A mould will then be taken of your tooth. It will be sent to the dental labs for preparation of the MAC veneer. 3rd visit – The MAC veneer will be bonded to your tooth. Porcelain Veneers start from £550 per tooth and we offer 0% and low interest payments plans to help break up the total cost of treatment. Arrange your free consultation today! The cost of the veneers can be high but our financing plans will help you get that smile you deserve.